I had my hayday with denim skirts many, many moons ago when they had frayed edges and were commonly paired with cropped black leggings. I shudder at the thought! I can still remember the outfit I used to wear. Cropped black leggings with lace trim, my 'edgy' denim skirt, and a watermelon green zip up sweater with pink accents. Why on earth did I think this looked good! The image still haunts me when I think about denim skirts. I don't typically reach for a skirt when I'm out shopping. Partially because I'm more of a dress type of gal - there's no tucking or matching or any of the inconvenience that comes with a skirt - and partially because I'm not confident in my ability to put together a cute outfit with a skirt! 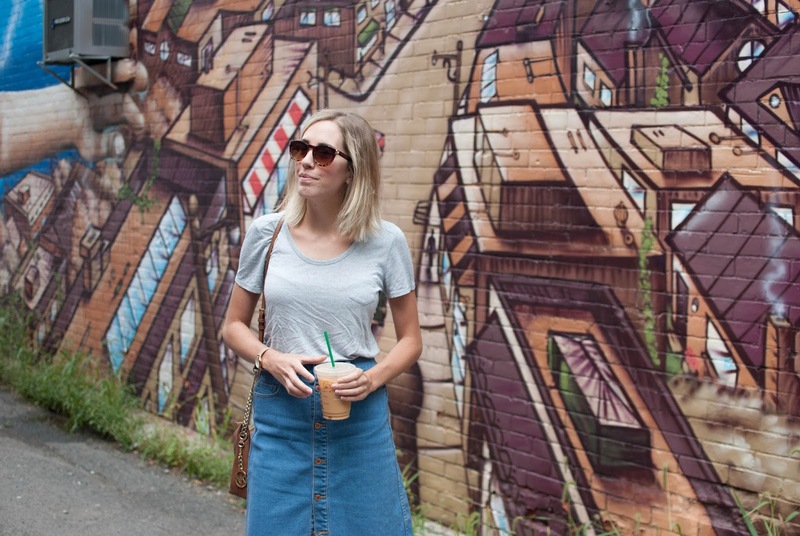 I was pretty stuck in my ways until a few weeks ago when this denim skirt entered my life. I was perusing the sale rack at Joe Fresh, as one does, and saw it for $12 (as of today it's $10!) so I decided I'd give denim another chance. After all, what did it do to me? I was the one who made the poor choices more than a decade ago! I bought it with the intention of wearing it with chunky knits into the fall, but over the weekend we had some errands to do in one of my favourite neighbourhoods in Ottawa, the Glebe, and I decided I'd pair it with two pieces that never let me down - a grey t-shirt and my white Converse. The last threads of summer are holding on and we're still feeling the heat which will make it really difficult once the cooler weather decides to arrive...and stay for the next six months. So after a quick stop for the first Pumpkin Spice Latte of the season (and likely the last - I'm not a huge fan, hot or cold!) 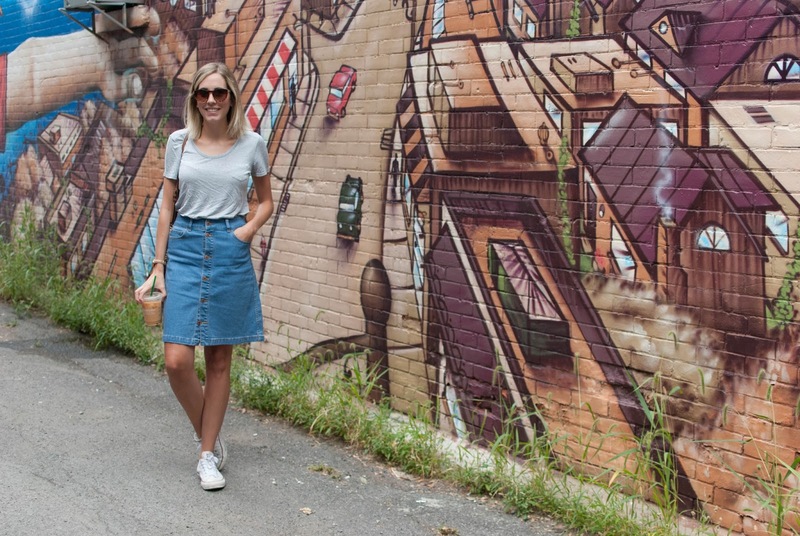 we ventured around the Glebe to get a few things crossed off our weekend to do list. I'm a big fan of the A-line shape of this skirt and the length makes it work appropriate and a great transitional piece. It's flattering in all the right places and the button detail down the front makes it unique. I've yet to be disappointed by a Joe Fresh purchase! I was hesitant about this one at first but as always, you came through for me Joe! I'll be sure to style this number again in the coming months with the aforementioned knits. Are you looking forward to the change of seasons? How do you transition your favourite summer pieces into the fall? I'd love to know!